We know Francis from his gravestone in the churchyard of St. John and Trea, Moneymore, and from his terse death notice in the Belfast Newsletter. 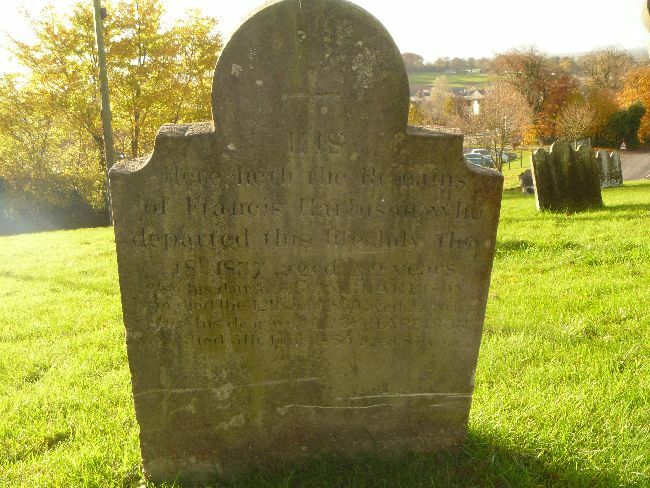 He's buried with his daughter Jane (1835 - 1860) and his wife Lucy Gribben (1798 - 1885). In the 1831 census, Francis' household, the first enumerated in Moneymore, was listed as containing one male and five female family members. One female was obviously Lucy. We have a record of the christening of a daughter Bridget in Ballinderry on October 25 1828. Who the other two older daughters were I've been unable to ascertain. Subsequent to the census, Francis and Lucy obviously had Jane, and also John, christened October 18, 1832 in Moneymore. The only link with William b. 1780 is his co-witnessing with Mary Donnolly, Willliam's wife, of the marriage of Patrick Wall and Isabella Mulholland in 1835 in Moneymore. Nonetheless, I think, given this and the geographic proximity, plus name and birthdate, the balance of probability is he was William's brother. According to Griffith's Valuation and the PRONI valuation books, Lucy lived at 19 Lawford Street, but the property was marked as ruined sometime between 1876 and 1878. There is no record of what happened to her. She also rented from the Church of Ireland slightly over 4 acres of land (plots 4 and 5) in Feenan Beg (see the map on the page for William for its location). According the valuation books, she retained this land until 1906, which would have made her 108 years old, which seems unbelievable. It was passed on to John Morris (see below). Far more plausible is that she had a spinster daughter named Lucy, whose death on 13 December 1896 is recorded in Moneymore, at the age of 66. Presumably she was one of Francis and Lucy's children, although this is by no means certain. Reporter is John Morris, whose wife Elizabeth (née McKenna) inherited Lucy's pittance (3 pounds). Lucy was living at 15 Lawford Street in 1893; John and Elizabeth Morris at 17 Lawford Street in the 1901 Census. Elizabeth was likely related by marriage; possibly her mother was a Harbison. Oddly, I can find no record of the older Lucy's death, other than the grave marker. In any case, other than Lucy, who've I've by no means established was a daughter, I can find no trace of Francis's other children. Probably a lot of sad tales there, untold.